National Green Tribunal has been established on 18.10.2010 under the National Green Tribunal Act 2010 for effective and expeditious disposal of cases relating to environmental protection and conservation of forests and other natural resources including enforcement of any legal right relating to environment and giving relief and compensation for damages to persons and property and for matters connected therewith or incidental thereto. It is a specialized body equipped with the necessary expertise to handle environmental disputes involving multi-disciplinary issues. The Tribunal shall not be bound by the procedure laid down under the Code of Civil Procedure, 1908, but shall be guided by principles of natural justice. It draws inspiration from the India's constitutional provision of Article 21, which assures the citizens of India the right to a healthy environment. The Tribunal is mandated to make and endeavour for disposal of applications or appeals finally within 6 months of filing of the same. On 18 October 2010, Justice Lokeshwar Singh Panta became its first Chairman. Currently it is chaired by Justice Swatanter Kumar since 20 Dec 2012. 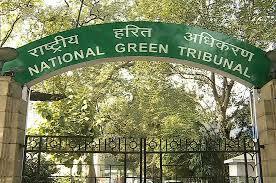 National Green Tribunal (NGT) is in News recently after green panel said that diesel vehicles which are 15- years-old should be de-registered first and will not get No Objection Certificate (NoC) for plying outside Delhi-NCR.